Food Day Canada is annually celebrated by all Canadians on the first Saturday in August. This civic holiday was established by a Canadian activist and culinary author Anita Stewart in 2003. Food Day Canada originated as the World's Largest BBQ. Anita Stewart organized this event in order to support local farmers and help them overcome the beef crisis that followed the US embargo on the Canadian beef. The reason was a single case of BSE, or mad cow disease, in Alberta. The disease is easily transmitted to humans by eating any part of the infected animal. 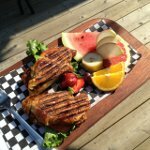 The Canadian barbecue became a very popular event around the world and in encouraged people cook with Canadian ingredients. Since then Stewart continued to call on her friends and cooks around Canada to organize BBQ on the first Saturday in August and celebrate Food Day Canada. Over the time Food Day Canada evolved into a special celebration by chefs. The chefs cook Canadian food and post their menus on Food Day Canada official website. All people across Canada are also encouraged to follow their example.